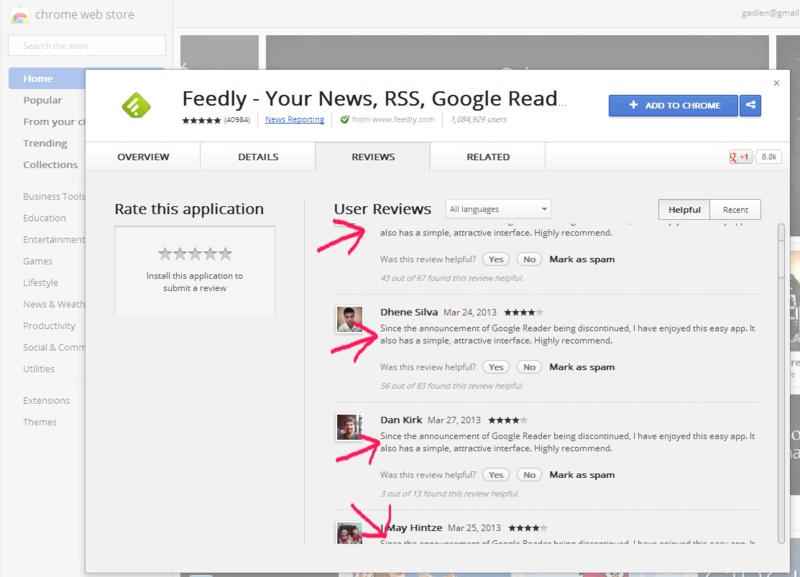 The Feedly RSS Reader for Chrome should not be trusted. Since they are cheating to get signups, it’s impossible to say what other bad things they are doing behind the scenes with your data. Let me give you a hint, the exact same comment was repeated word-for-word by over 40 different people in the review section of this Chrome Extension. I know it’s a near impossible task, but you should always be on the lookout for fake people (AKA Sockpuppets) recommending products. I reported this incident to Google but it’s happened a lot before and it will happen a lot in the future. I mean, if you were to create a bunch of sock puppet accounts, you’d use a Scrapper and Spinner to make the content unique. You’d also test it before rolling it out to a real website. Because the best automated stuff doesn’t look automated.